The Pearson 323 was produced by Pearson Yachts in Portsmouth, Rhode Island from 1976 through 1983. Although the exact number is unknown, it is believed that 385 or more were built. Designed by Bill Shaw and his team, as most Pearsons' were from the mid – 60's on. The P323 bucked contemporary design trends of the time by being very focused on its designated purpose rather than following trends to meet IOR rules. In the mid 1970s, IOR rating rules influenced the design of many yacht from major builders like Catalina, Ericson and Islander. Many of the boat designs of this era represent a compromise in cruising attributes with the rule-beating design specifications of the IOR. The results were often less than desirable, sometimes yielding awkward looking and sailing yachts. 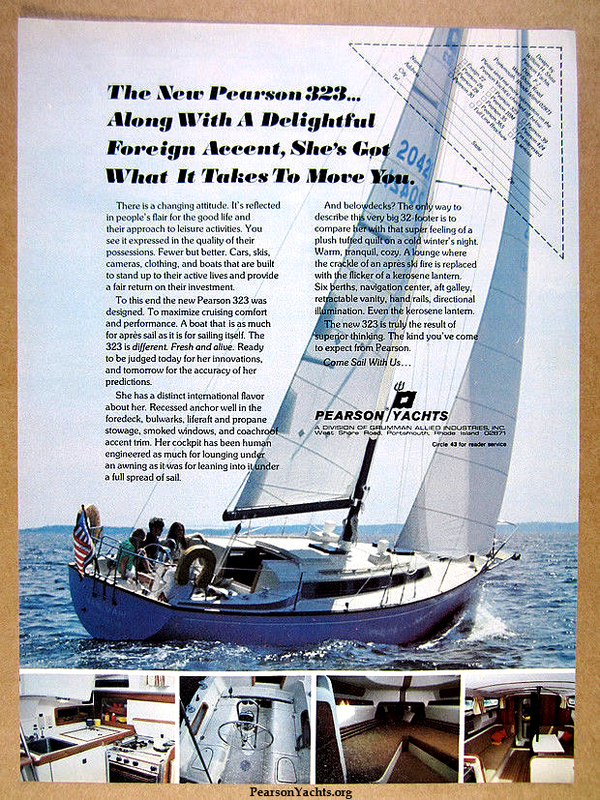 As true innovators in fiberglass boat building, Pearson Yachts, as we knew it, closed in 1991. 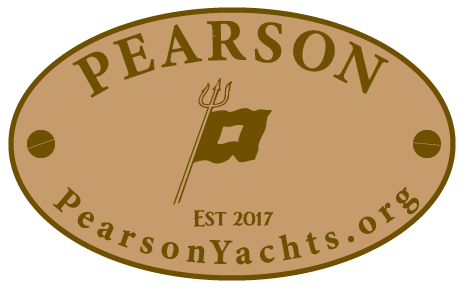 More history and references can be found at Pearson Yachts Portal from the main menu. Bill Shaw, the designer of the Pearson 323, had a remarkable career. 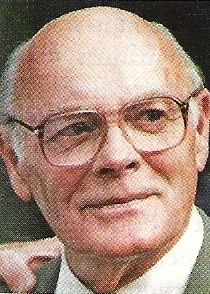 He started working for S&S in 1952, leaving in the early 1960's. While at Sparkman & Stephens he was involved in the design of many famous yachts, including the America’s Cup defender, Columbia, as chief designer. In 1964 he was hired as chief naval architect for Pearson Yachts. He later became general manager of Pearson Yachts and vice president of Grumman Allied Industries and continued to be Pearson’s chief naval architect. During his 27 years at Pearson, he and his team designed over 40 different boats. 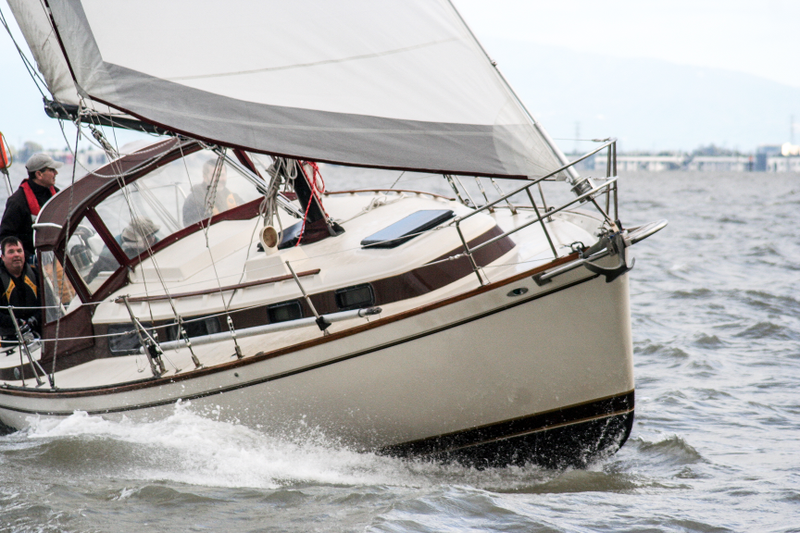 Bill designed the 323 as a coastal cruiser without regard for the IOR ratings. He designed it for comfort, capability and style, targets that he seemingly hit. This is one of the reasons why the 323 and most other Pearson's are still being enjoyed, and treasured, by their owners today. 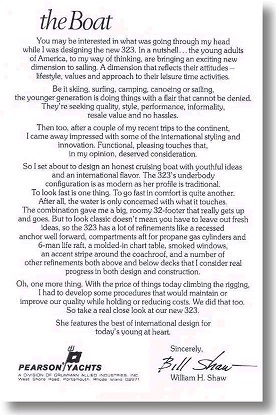 With the 323 he set about to design an honest cruising boat with youthful ideas and an international flavor. See the words of Bill Shaw himself below in "the Boat"
The only rule to which she was designed was the personal rule of Bill Shaw... that	a boat should be safe, attractive, and a delight to sail. See interview on Bill's design philosophy in the mid-80's. Although not explicitly stated in any Pearson literature, the 323 target was the middle of the price market for this size boat. The money was spent on the structure and functional equipment rather than on the cosmetic bits. This resulted in a solid, thick fiberglass hull, good sailing characteristics and spacious accommodations. Although no speed demon, the 323 can move at 5 knots in an 8 knot breeze and will cruise near her hull speed as the wind climbs into double digit speeds. The 323 doesn't like to be overpowered, so aggressive use of the reefing systems will keep the boat comfortably moving at top speed. You may be interested in what was going through my head when I was designing the new 323. In a nutshell... the young adults of America, to my way of thinking, are bringing an exiting new dimension to sailing. A dimension that reflects their attitudes - lifestyle, values and approach to their leisure time activities. Be it skiing, surfing, camping, canoeing, or sailing, the younger generation is doing things with a flair that cannot be denied. They're seeking quality, style, performance, informality, resale value, and no hassles. Then too, after a couple of my recent trips to the continent, I came away impressed with some of the international styling and innovation. Functional, pleasing touches that, in my opinion, deserved consideration. So I set about to design an honest cruising boat with youthful ideas and an international flavor. The 323's underbody configuration is as modern as her profile is traditional. To look fast is one thing. To go fast in comfort is quite another. After all, the water is only concerned with what it touches. The combination gave me a big, roomy 32-footer that really gets up and goes. But to look classic doesn't mean you have to leave out fresh ideas, so the 323 has a lot of refinements like a recessed anchor well forward, compartments aft for propane gas cylinders and 6-man life raft, a molded-in chart table, smoked windows, an accent stripe around the coachroof, and a number of other refinements both above and below decks that I consider real progress in both design and construction. Oh, one more thing. With the price of things today climbing the rigging, I had to develop some procedures that would maintain or improve our quality while holding or reducing costs. We did that too. So take a real close look at our new 323. She features the best of international design for today's young at heart. The more time one spends on a 323, the more one recognizes the more subtle elements of this thoughtful design. While she only draws about four-and-a-half feet of water, her ability to point isn't significantly compromised when sailing upwind. Many boats of this size with a displacement of 6.5 tons could be very slow and unresponsive, but the 323 benefits from the stability of large displacement while remaining lively under sail. This is also one very roomy boat. Although she'll only sleep five (a starboard quarter berth was deleted from the original design in favor of the nav station), the roominess of the cabin and the two spacious cockpit lockers provide more usable space than most other 32-footers. Overall, it's a design that was well thought out and holds up very well today. How many other things from the 1970's can one say that about?